Once again UK-Racketball will be making the trip to the South West and one of the country’s best racketball venues: Devon and Exeter! 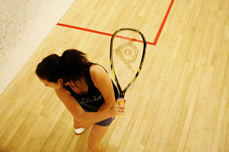 The Devon and Exeter club is one of the best supporters of racketball in the county; with a fantastic local following, it is a beacon for the sport in the South West. 2012’s event was well contested across all grades with local D+E girl Karen Beeley coming through her group in the B grade before being beaten by club mate Louis Robjant in the final. 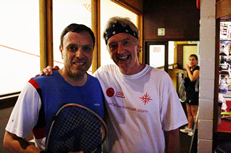 As The Devon and Exeter club is one of the best supporters of Racketball in the county, last years event saw a great turn out with 22 competitors battling it out in the B grade. Billy Jones had gotten to several finals in the B Grade before but had yet to emerge as the victor. He clearly put in all of his efforts and strength for this match though, because he won the encounter 2-0 to win his first ever B Grade title!